Little is known of where he came from or how he came into being, mearly that he was, and always has been. Some say that he is all of imagination, and that within his walls all is possible, so long as he wishes it to be so. Creation: Within the Labyrinth the Lord can create and make anything he chooses, even pulling from the minds of those who enter. Crystal Orbs: The Lord can summon a seemingly endless supply of perfectly clear glass orbs. Through these orbs he can work endless feets. Visions of the future, seeing into other realms or places, being able to transport an item or pull it from some other place, summon a creature are but just a few of what he can accomplish. Outside of the Labyrinth the orbs lose there massive power and each one must be used for a single task. If he wishes to see the future then the orb with him can only be for that purpose. Formless: No one has ever seen the true form of the Lord of the Labyrinth as he always takes on a new and unique fascade to trick his target. Through his unique magic the Lord can become anyone or anything he choses: An old crone, a lowly troll, a beautiful woman, a bird, etc. Reality break: The most unique power that the Lord posesses is his ability to break the rules of reality. This is seen in the way the labyrinth acts and shifts, and in how he can seem to walk on a wall or ceiling as if it was the floor. Many believe it is just another form of magic, where as to the Lord and in his arrogance he is beyond the bounds of man. Ageless: The Lord of the Labyrinth has appeared throughout time and across the world, thus many think he is immortal. Even when it seems he suffers defeat he returns again to visit man. The ancient world of man was a time of great mystery and magic. Gods, monsters, and heroes became the things of legend to modern man. But all legends are based on fact, on something that was so real that it would forever survive the course of time. The lord of the Labyrinth was one such being. A God unto himself and a being like none other, his was the power of mystery, wonder, and impossibilty. A being with the power to ensnare the soul of countless wanders and forever hold onto them. Thus was the Labyrinth, a world where the impossible lived. The Labyrinth was a world unto itself, home to the creatures of legend. Here he was unopposed, here he was lord, save for those few who posessed the strength and wisdom to outmatch his mind. Those who failed were doomed to wonder for eternity in his Labyrinth, destined to be warped and changed by the madness that would take them. The old world of man knew that when the Lord of the Labyrinth came, it was best to strike a deal with him first lest one be taken away. Children were offered to placate him, vast and glorious gifts given to him. And he never came as the same person the Lord of the Labyrinth didn't. Sometimes it would be as a wise old man, others a beautiful woman of unsurmounting grace. 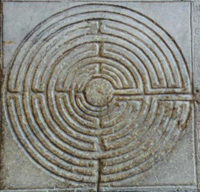 Thus it was that the Lord of the Labyrinth came as Daedalus and built the Labyrinth for King Minos of Crete to imprison his wife's son, Asterion, the Minotaur. It was a dark place, one frought with many a twist and turn, and paralleled dangers the likes of which no mortal man had ever seen. It was said that other beasts roamed the Labyrinth, monsters and beasts theat none but the gods could imagine. Those who entered never returned, lost forever in a world of fanciful thinking and utter madness. In Egypt, Herodotus was brought upon a maze within the city of Krokodilopolis, a place so immense that it was greater than the pyramids themselves. He never truly knew why it was there, mearly that it was build for a God the people worshipped. The tomb of the great Etruscan general Lars Porsena contained an underground maze of such size and granduer that those who searched within it for Porsena's tomb became not only lost in body, but in mind as well. The writings of Varro as quoted by Pliny spoke of it in his writings with such detail that it was thought a great myth and legend. Had the Lord of the Labryinth been here as well? Cultures near and far were touched by the power of the Labyrinth, etched it upon there bodies in tatoos and built about there homes as entertainment. None could escape it's mystery. In the America's he was known as I'itoi, the mischievous creator god to the people of the Tohono O'odham Indian Nation. Sadly though, the Lord of the Labyrinth's reign on the mortal world would fall, and he like so many of great power and magic would fall away to legend and myth. Thus it was that one man would bring his downfall. Like so many, the Lord of the Labyrinth challenged him, dared him to find his way through his world to the center, and there within take his choice of the treasures there. And so the man did, and succeeded did he. Upon reaching the center he called for the Lord of the Labyrinth, demanding his prize. But what he asked for was not what the Lord expected. Looking the Lord of the Labyrinth in the eyes he demanded a story, one not of legend that would traverse the span of time, but of paper and ink. He wanted a story of mystery, magic, and wonder, a tale that would ensnare the mind and fill it with such visions... visions of which could only be held within the Labyrinth itself. Thus the Labyrinth dissapeared, the Lord with it, forever locked within the pages of a book... a slave to the minds of those who read it. But even trapped within the pages of a book, the Lord of the Labyrinth still touched the mortal world. So long as his mystery, symbols, and legends persisted, he could never be held, never be bound. Throughout the history of the mortal world has the Labyrinth existed, spanning across the globe. And even when it's presence wasn't touch by man's body, his mind wandered to it. Maurits Cornelis Escher could not escape it's touch, his mind forever bound to dwell within it. Only through his drawings and creations could keep his sanity. Perhaps he would have been different had that book he found not sat on his shelf. This book of old that held such sway and power that it would open the minds of millions to untold wonders. In the modern world the books power through its many copies would touch many, inspiring and enlightening the imaginations of all. One such copy fell into the hands of Jim Henson, and through its magic he brought to life just some of the countless denizens that lived within the Labyrinth. Indeed, he even brought the Labyrinth itself to the world. 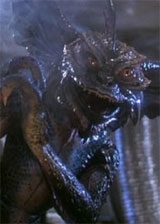 The most insideous and dangerous of the Lord of the Labyrinth's creatures, they are also the most common. The gremlins live for mischief and torment. For them its all fun and games, especially when someone loses an eye! Typically a small creature, the gremlins have a hard, lizard like skin, always have a slight reflective sheen to it as if damp. Sharp claws adorn the end of each claw, both foot and and hand having three digits. The teeth of the gremlin are needle like and razor sharp and rend flesh exceptionally well. Each gremlin is capable of speak, but they tend to say very little as they are either busy yelling or laughing. Perhaps the ost unique and down right mystifying ability the Gremlins have is to appear in just about an place without warning or explaination. Be it a closet, a locked room, the inner workings of a watch, they get into everything. Not even the Lord of the Labyrinth knows how they do it, he just lets the mystery be. No sense in going crazy over something you can't solve. 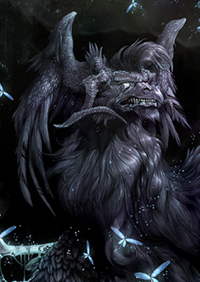 Thee most varacious and feared creature of the Labyrinth, the Fetted Screamers roam the skys over the Labyrith, circling like vultures, praying on anything they see. Harbingers of doom, stay hidden, for if ones shadow comes upon you, you can be sure that it's all over. A massive beast, it has a wing span of 60 feet, razor sharp talons and claws with the muscular might to take on many a foe. To add to it's already frightening visage, the beast is of the undead, its body seeming to rot. This not only adds to its fearsomely grotesque appearance, but aids it in battle as it feels no pain. Always surrounding it is a vicious horde of pixies, the little cretures acting like stinging bees as they attack with it, wanting a piece of the kill. Thankfully, the Fetted Screamer attack can be heard before it's seen. As it's name indicates, it screams, a loud, ear piercing wail of a noise loud enough to strike at the ear drum of even those who or deaf. 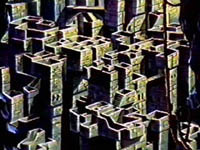 The Lord of the Labyrinth created the Fetted Screamer for only a few purposes: The first to prevent those within the maze from flying out or walking upon the tops of the walls... thats cheating after all. Another being the protection of his Castle. Should any try approach his home without invitation they are immediately set upon by a blood thirsty horde of Screamers. Scattered throughout the Labyrinth are the reanimated dead of those long trapped. Like the gremlins, the goblins are numerous and many, however not as smart. Varied in size and shape the goblins are found in all different areas of the labyrinth. Some are bashful and harmless, dullwitted and slow, while others are down right vile and nasty. The Labyrinth has many different wonders within, it's no surprise that nature itself is abound in its various ways. From insect to animal, all manner of creatures are found. Some areas of the Labyrinth are heavily forested, and at times even the plants have a life of there own. Through out the Labyrinth are people who never quite found there way out, and so continue to wander, hoping to find the exit. The wanderers tend to be a valuable resource when found, having varied knowledge from there time inside. Some wanderers however succumb to the magic and various hazards of the Labyrinth; some even suffer the wraith of the Lord himself. Those who do are forever changed, become apart of the Labyrinth itself, becoming one of many different creatures within. Those the that serve the Lord of the Labyrinth loyaly will become more than they once were, being changed and given abilities. Some are creatures of legend, others are objects brought to life, animated. Whatever the case these beasts are the greatest of the Lords creations, and serve in the compacity as his loyal servants and protectors.